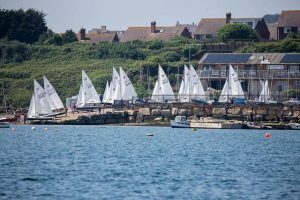 Nearly 40 boats turned up at Castle Cove Sailing Club on the 1-3 June 2018 to compete in the 60th Anniversary National Championship sponsored by Craftinsure and Hartley Boats. In the lead up to the event the weather forecast was suggesting that Friday would provide the strongest wind, Saturday would be light and variable and Sunday’s wind would be somewhere between the two. In the event the weather did not play ball for the whole weekend but Bill Barker, the Race Officer, and his team did a fantastic job to complete six points races in challenging conditions. Friday dawned a bit murky. The proposed schedule was to have a practice race followed by the first two points races of the Championships back to back. Because of the poor visibility the decision was taken to race in the harbour rather than in the bay. The fleet launched into a south-westerly of 8 to 10 knots. Unfortunately, as the practice race started, the weather closed in and it was difficult to see the windward mark and gybe mark. 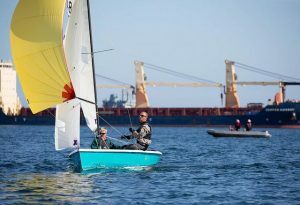 By the time the leaders were racing on the second reach of the triangular course their nearest competitors were very barely visible and the leeward mark could not be seen. The race was finished at the end of the first triangle and won (we think) by Brian Lamb and Sam Pygall who took home the Idler’s Bucket for their efforts. The fleet was then sent ashore in close company marshalled by the RIBs. Conditions did not improve and the first and second points races were postponed to the following day. The forecast for Saturday was for better conditions and when the competitors arrived for the briefing it looked as though we may manage to sail four races and partly catch up with the schedule. In the event, a sea fog rolled in as the fleet was about to launch. The Race Officer sensibly postponed the racing until later in the afternoon. By 1600hrs the fog had dispersed and the fleet enjoyed three races before returning to the shore after 1900hrs. The first two of these races were sailed in 5 to 7 knots but by the time the third race started the wind was softening further. The Race Officer shortened the third race at the end of a very slow first reach but even then some boats failed to finish within the time limit and were given their places on the water. Most boats were towed home. re, the wind quickly softened and by the time third race started lottery funded conditions prevailed and several of the front runners sailed their discards. In spite of all these difficulties, racing was close throughout the fleet. From the six completed races there were five different winners. 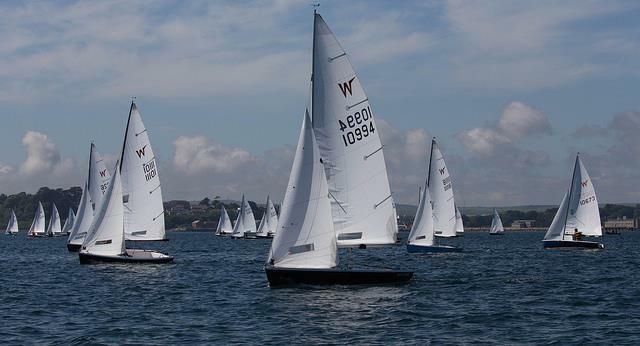 The winners of the Championship overall won only two races but above all were the most consistent boat in the fleet. Congratulations go to Michael McNamara and Simon Townsend from Rollesby Broad SC who won the Championship once more. They also took home the Plymouth Trophy as winners of the fourth points race. Runners up were Len Jones and Peter Mitchell from Medway YC who also won the Aln Trophy for the second race of the Championship. In third place were former champion Guy Marks and Mel Titmus from Bough Beech SC who also won the first points race and with it the Lionel Monk Trophy. The other race winners were Richard Stone and Catherine Gore from Medway YC who won the third points race and the Ian Proctor Trophy. 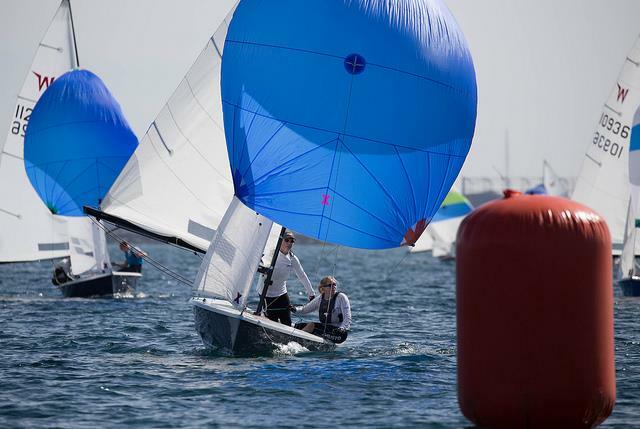 Colin May and Sarah Wallis from Parkstone YC won the last completed points race and the Bill Hodshon Trophy. It was interesting to see many new faces in the fleet this year, several of them performing very well. 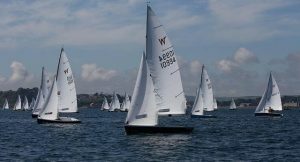 Not new faces, but not seen in a Wayfarer for a decade, were Geoff and Nick Hodshon who returned to the fleet for the first time since the 50th Anniversary Championships sailing their 60-year-old Wayfarer, Nipegegi, (W198). Together with their late father, Bill, Geoff and Nick have won the National Championships a total of five times in Nipegegi. Geoff, Nick and their sister Penny were delighted to present the Bill Hodshon Trophy to Colin and Sarah. Similarly, Liz Feibusch competed in her boat and was very pleased to present the Wansfell Trophy to Monica Schaefer as the best placed lady helm overall. Monica and her crew, Miriam McCarthy from Greystones SC, Co Wicklow, also won the Hartley Boats Trophy as best placed overseas entry. 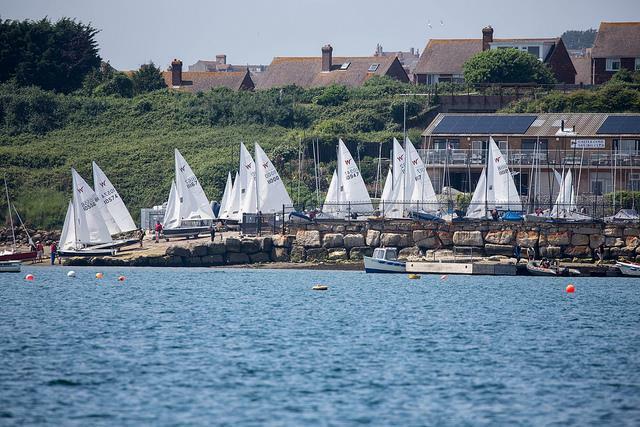 The winners of the Silver fleet and best placed newcomers were Ian Foxwell and Trevor Cox from Medway YC. Winners of the Bronze fleet were UKWA Cruising Secretary, Andrew (Boris) Morrice and Chris Yerbury from Bristol Corinthian YC. Mark and Jane Lee from Medway YC won the Pert Platter as best placed husband and wife team, Tony and Nathan Geary from Waldringfield SC won the Carrick Trophy as the best placed double generation team. Medway YC won the Club Team Trophy. Of course, a Championship in a class like the Wayfarer is not only about the racing and taking home the silverware, although that’s important. It’s about renewing old and making new friendships, sharing stories and experiences. Frustrating though the delays might be, there were plenty of opportunities to drink tea or beer together, to visit the local area, to boat bimble or complete some more mundane chores. Datchet sailors went to watch the beach volleyball in Weymouth (I assume there’s not much sand in Slough, that’s why they went, right? ), Mark Lee detuned and retuned his boat (very successfully as it turned out) and had time for a round of golf (a championship ritual) and Mike Mac managed to organise an alfresco haircut. Our hosts couldn’t have done more to feed and entertain us. The bar was often open, there were meals morning, noon and night and a live band on Saturday evening which compelled even the most dance-floor-shy to play air guitar in the dinghy park (he thought it was dark and couldn’t be seen doing the Shadow’s walk to the famous sound of Apache!). Thank you to everybody at Castle Cove SC for all their hard work. This was a fitting way to celebrate the boat’s 60th birthday.